Yeah or Neah: Peeing in the Shower? I just read a really great post about peeing in the shower over at JaneDuttonutrecht entitled Waterworld. It's all about an initiative to encourage citizens to pee while showering to save water. It reminded me of that Seinfeld episode where George gets caught peeing in the shower at his gym. After quite a heated discussion with Elaine, he shouts "It's all pipes." So this toilet-loving blogger wants to know: Do you pee in the shower? Strangely I'm a HUGE FAN of perpetually changing my shower curtain out in the bathroom. I scour the internet looking for holiday-themed curtains and then do this mad redo of the entire theme of my bathroom. 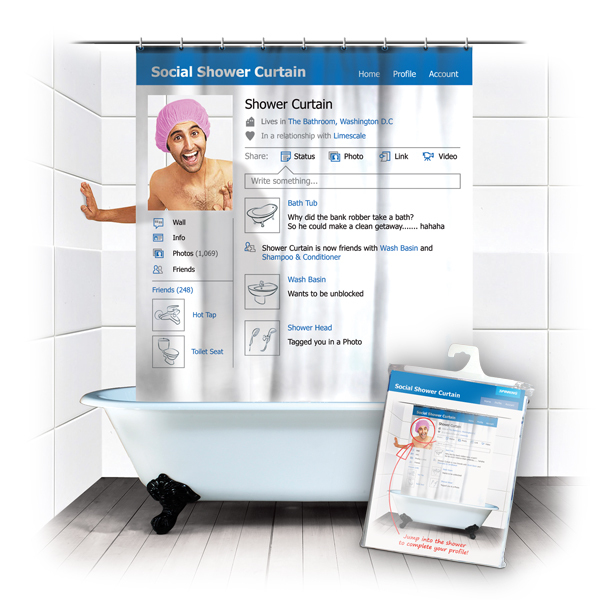 My friend Michelle sent me a photo of this shower curtain because of it's obvious nod to Facebook and I have to say this one is pretty clever, but it wouldn't go with anything else in my bathroom. Sadly I'll have to leave this one alone and let the college kids buy it for their dorms. It definitely seems suitable decor for them along with their shower curtains depicting the periodic table or the New York City skyline. But I still love it. Especially the dude wearing the pink shower cap.